How much will these wardrobes cost? Every wardrobe is bespoke in terms of size and finish, nothing is pre-made so we are unable to have set prices. But to get a better idea of what your wardrobes will cost roughly, call us now on 02085711354 with approximate dimensions and we will be happy to give you a guideline price over the phone. If you are happy with this then we can get you booked in for one of our free design visits. How quickly can I get my new wardrobes? This can really vary from anywhere from 2 to 6 weeks from the moment we receive a deposit. Speak to one of our team now to find out how quickly you can have your new wardrobes installed. 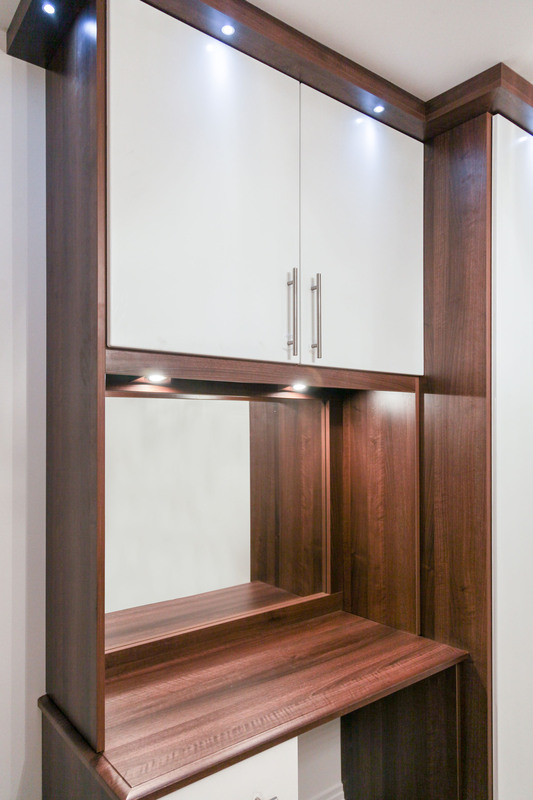 We only use 18mm thick MDF and MFC for our wardrobes. These solid materials coupled with our great workmanship are the reasons why we are able to offer you a 12 year structural guarantee. We also do real wood if you prefer but you would have to speak to our design consultants about this. We take a 75% deposit – this will secure your installation date, purchase your raw material and allow our production team to start production. We only ask for the final 25% upon completion to your satisfaction giving you full peace of mind.